10 people were killed on Friday morning, 5/18, at a school shooting in Texas. 10 more were injured. It happened around 8 a.m. at Santa Fe High School near Houston. 9 students and 1 teacher were killed when a gunman opened fire in an art classroom. The 17-year-old suspect, student Dimitrios Pagourtzis, is in custody. Texas Governor Greg Abbott said that two other people are being questioned about their involvement in the incident. 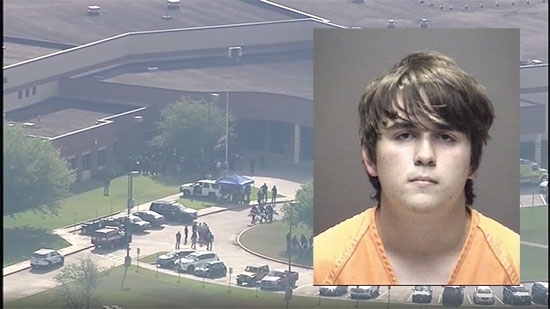 Authorities have discovered possible improvised explosive devices, IEDs, inside the school and off campus at his home and in a vehicle. They are in the process of disarming those explosives which include a CO2 device and a Molotov cocktail. The suspect used a shotgun and a .38 revolver. The weapons were obtained from his father who legally owned them. Abbott said in a press conference that Pagourtzis planned out the shooting and wrote about it on his computer, cell phone, and in journals. He also planned to commit suicide, but surrendered to officers. Pagourtzis is being held without bond at Galveston County Jail. This is an active investigation. Philadelphia rapper Meek Mill is no longer participating in a panel on prison reform at the White House on Friday, 5/18. Mill backed out after more attention was being paid to his meeting with Donald Trump than the issues and purpose of the summit. "I was originally scheduled to be part of a panel on Prison Reform at the White House to help shed light on the issues within the system. Unfortunately, the focus turned to the President and myself which concerned me that it might take away from creating a positive result from today’s discussions. As a result, I decided not to attend, so that the focus would be solely on fixing our prison system. Most importantly, I remain fully committed to improving our criminal justice system," Mill said in a statement. Mill was recently released on bail from a Pennsylvania prison. He was sentenced to 2-4 years in prison November 2017 for violating probation. He has a hearing in June. An 11-year-old boy was struck and killed in a hit-and-run in South Philadelphia this afternoon. It happened just after 3 p.m. on the 1000 block of Shunk Street. The child was crossing the street when he was hit by a dark-colored Honda SUV. He was rushed to Jefferson Hospital where he was pronounced dead. There have been no arrests.